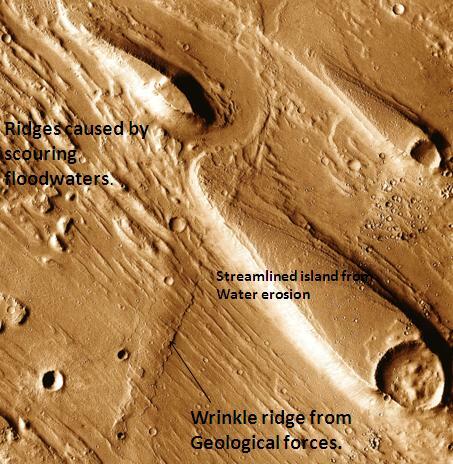 Ares Vallis (Mars Valley in Latin) is a large valley that appears to have been eroded by ancient flows of water. It is located in the Oxia Palus quadrangle, at 10.4N and 25.8 W (334.2 E). Ares Vallis connects the mountainous Margaritifer Terra with the Chryse Planitia delta. The valley passes through the ancient Xanthe Terra highlands. Ares was named after the Greek name for Mars, the god of war; it appears to have been carved by fluids, probably water. Ares Vallis was the chosen location for the 1996 Mars Pathfinder mission. The Sojourner rover explored the border of Ares Vallis with Chryse Planitia. A panorama of the Ares Vallis landing site of the Mars Pathfinder lander. Annotated panorama of the Ares Vallis landing site of the Mars Pathfinder lander. Annotations of surrounding features and rocks identified by the Pathfinder mission team. ↑ Parker, T.J., Clifford, S.m., and Banerdt, W.B. 2000. 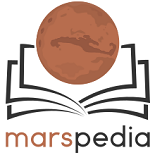 Argyre Planitia and the Mars global hydrologic cycle. LPSC XXXI, Abstract 2033. This page was last edited on 8 February 2019, at 17:04.